Why do Pilates teachers always talk about neutral? What does it mean and is it important? Well, neutral can relate to almost all of our body alignment, such as feet, head, rib-cage, pelvis and spine. 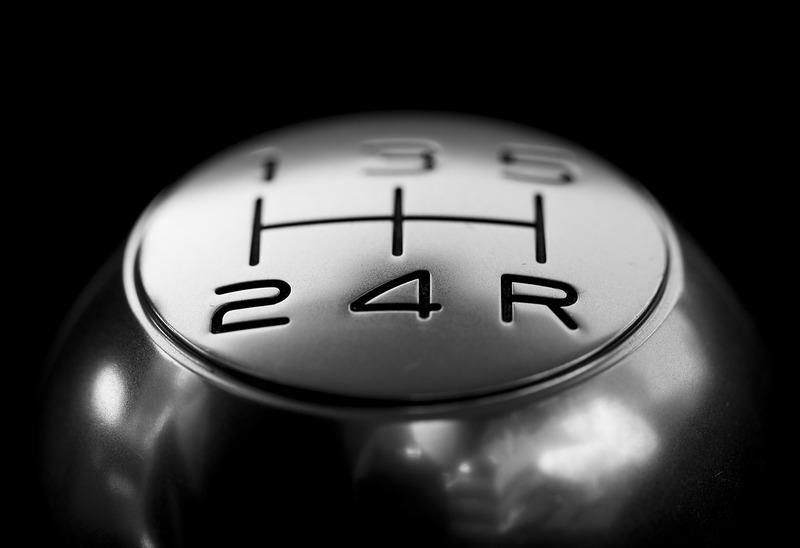 And like a car being in neutral gear, it means a position from which we can best move from. Our muscles are neither shortened nor lengthened. Our joints are in position for optimal movement and stability with minimal friction. So, let's just take one part of the body - the pelvis and lumbar spine. The image on the left shows a neutral pelvis with bony landmarks labelled. The three pelvic images below and to the left represent neutral as well as anterior and posterior pelvic tilt. The arrows show the direction of the pelvic tilt. The relative position of the ASIS (Anterior Superior Iliac Spine), pubic bone (pubic joint) and the hip joint can also be seen. So, how to know if we are in neutral here or not? There are several ways to assess pelvic alignment, but there's no gold standard measurement and everyone's neutral will be slightly different as our bodies are unique. One method is line up the ASIS bones and the pubic bone. This is most easily felt when we lie on our back, with legs bent. If the bones feel fairly level on the front of the pelvis and we have a gentle upward curve in the lumbar spine - we're in a neutral position, or working towards one. In contrast, if, when we lie down, the lower back is flat on the floor and we can't slide fingers under the lower back, then we're in a posterior pelvic tilt. We may also feel the pubic bone is higher than the ASIS bones. So, is it important to be neutral? Have a look at the five following advantages to a neutral pelvis (as compared to a posterior tilt). In neutral, our muscles are in mid-range. Take the gluteal muscles; they are neither stretched nor contracted. They are ready to work. However, in a posterior tilt, glutes will be at a disadvantage. They may well feel tight because they are gripping to hold the pelvis in this position, but they won't be strong muscles. Similarly, studies of the deep, postural muscles in neutral alignment show higher activity levels. In a posterior pelvic tilt, the deepest abdominals and pelvic floor are less active. This means we're less stable in this alignment. In neutral, our joints are also ready to move. For example, the hip joint is free to move with a low likelihood of friction and therefore damage. In contrast, in a posterior pelvic tilt, the head of the femur will be pushed forward in its socket and therefore friction and damage to the joint are more likely. Hip movement is also likely to be restricted. In neutral lumbar alignment, the discs, vertebrae, ligaments and muscles are all in an optimal position for movement, stability and shock absorption. In a posterior tilt, the lumbar spine is flattened meaning the discs are more likely to be damaged because of the forward compression when combined with loading of our body weight. In neutral pelvis, the pubic joint and the sitting bones are in place to take the weight of pelvic and abdominal organs. In a posterior pelvic tilt, the bones are in a different position meaning the pelvic floor muscles and fascia have to help take the weight of the organs instead. This is one risk factor for pelvic organ prolapse. If all of the body is well aligned, muscle balance should be optimal. This means muscles will be in mid-range, neither lengthened or shortened. 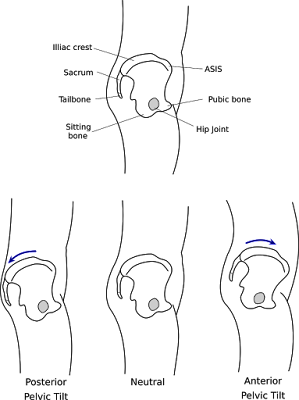 But in a posterior tilt, there is an effect above and below the pelvis on other connecting muscles. For instance, hamstrings, which attach to the sitting bones, will be shortened. The diaphragm increases this pressure as we breathe. With neutral rib-cage and pelvic alignment, this helps to stabilise us. However, if the alignment isn't neutral, the effects of this pressure can change. A posterior tilt can create an altered and upward pressure on the abdominal organs moving the guts closer to the diaphragm and increasing the risk of a hiatal hernia. So, these are some of the reasons that Pilates teachers encourage neutral alignment. Body awareness is a big factor here as many of us are unaware of our alignment, Pilates teachers included! For the posterior pelvic tilt, it tends to come from a gluteal gripping pattern. This may have started during pregnancy as a way to stabilise or it might be a result of sport or dance training. Alternatively, we might do it more consciously as a way of flattening the lower abdomen to feel slimmer. Whatever the reason, it's worth releasing the hips and working on the gluteal gripping to gain the benefits of neutral! Okay, so I'm not talking about contraception, I'm talking about the sheet of muscles in the lower ribcage that we use to breathe. Here it is (courtesy of 3D Yoga) in motion. It's funny which muscles we're more aware of in our bodies. We don't necessarily all leave school with a good understanding of anatomy and how our bodies function. But if we're a singer or a musician we may be more likely to know about our diaphragm and how it moves as we breathe optimally. If you work in the fitness industry, go to the gym or read fitness magazines then you may notice that the fitness world appears to be obsessed with certain muscles. Many of these muscles are associated with body building and weights such as abs, pecs, traps, lats, biceps etc. 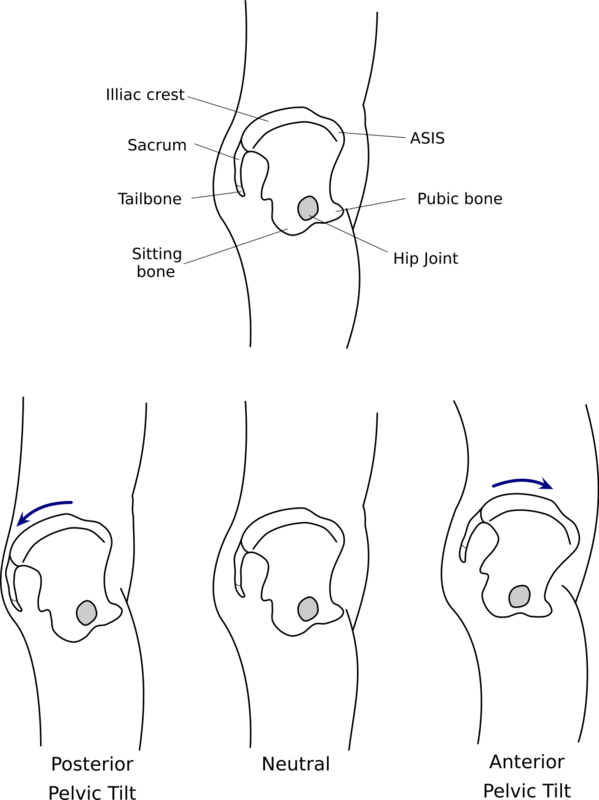 In contrast, the diaphragm has a relatively low public profile. Few people go off to the gym because they want to get their diaphragm firing, stretching and strengthening. But we should be! We should be more aware of it! Perhaps the diaphragm just needs some good PR to help boost our awareness? Because without this baby, basic functions such as breathing, blood circulation and digestion would either not happen or would not work as well. It's not going to sell magazines by being on the cover. But its health should be high up there on our list of priorities. If you're not yet convinced, here are 6 reasons to be more aware of your diaphragm and to use it better. We need it to breathe well (basic stuff - this helps keep us alive - do our biceps do this?) 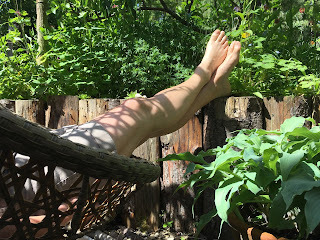 And when we breathe well we get other benefits too (see take a breather blog). It helps blood pump from and to the heart (again, hard to ignore, basic life-giving stuff). It keeps our ribcage mobile when it's active. And a mobile upper back can take some of the strain out of the lower back. It is a big part of our core strength (see getting down to the core blog). More good news for our lower back. It makes a big difference to our digestion (optimal breathing using the diaphragm helps to massage our digestive system improving how well we digest food). It helps to balance out pressures and forces through the abdomen - associated with hernias, organ prolapse and diastasis recti. If you're convinced, you can get started by feeling under your lower ribs on the front of the body. Push your fingers up and under the lowest ribs. As you breathe in the diaphragm pushes your fingers out and away and as you breathe out it moves up and allows your fingers to move further up under the ribs. You can leave your hands here and watch the video above again and see if you can get a sense of what you feel with the image on the screen. To keep your diaphragm healthy, like any other muscle, we need to use it. We can do this by gently aiming our breath down to the lower ribs on the sides and back of the ribcage. Have a go and keep the effort relaxed and the exhales long. Here's to the diaphragm and all it does for us! A recent study published in the International Journal of Sports Physical Therapy* found a significant relationship between breathing and functional movement. Participants with normal breathing performed better on the functional movement tests than those with dysfunctional breathing. The functional movement tests were based on exercises like squats and lunges that involve both mobility and stability. 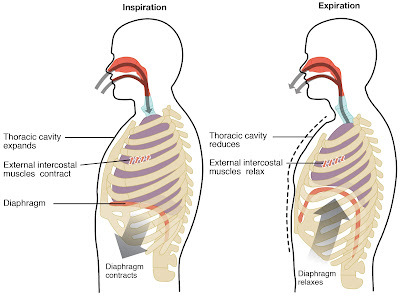 Normal breathing was defined as diaphragmatic breathing and dysfunctional breathing was breathing that uses just the upper chest, over-using neck and shoulder muscles with less use of the diaphragm. Really, the majority of us are somewhere between normal and dysfunctional. Most of us can improve our breathing and feel many potential benefits from doing so. These benefits can be better sports performance, improved mobility in the spine and rib-cage, improved core strength (as the diaphragm is a key part of our core (see Getting down to the Core blog)), less pain in neck and shoulder muscles and also decreased stress levels. I would call this normal breathing optimal breathing as we can work towards it and for many of us it isn't yet normal! Optimal breathing uses the diaphragm for 75% of effort and the intercostals between the ribs account for the remaining 25%. This means that neck and shoulder muscles are barely used to breathe with. 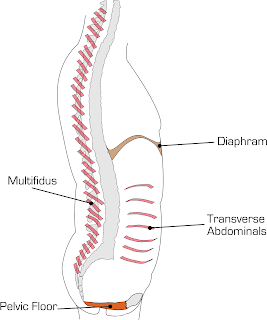 The diaphragm connects to the base of the breastbone, to the lower ribs and to the lumbar vertebrae. It separates the thorax from the abdomen. 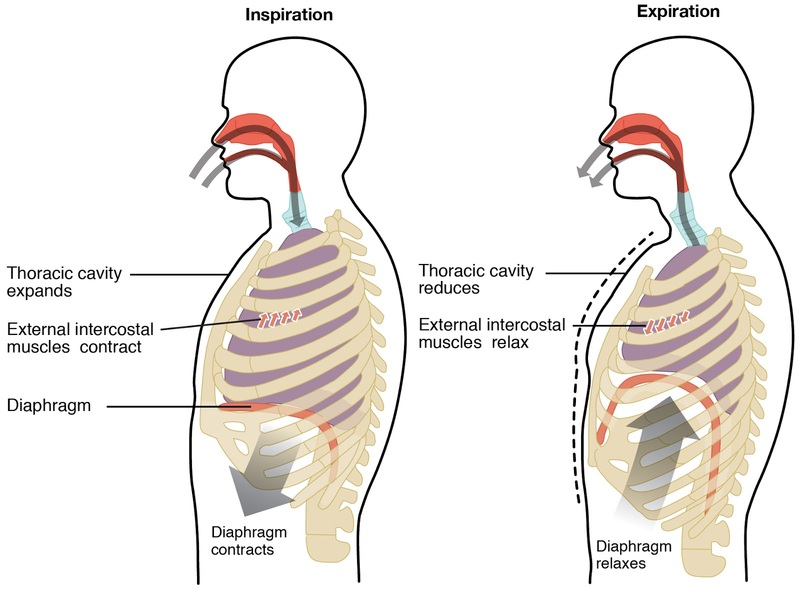 The diagram above shows, as we inhale, the diaphragm contracts and it's outer edges pull the ribs outward and upward. The intercostal muscles help by pulling the ribs further apart. The thoracic cavity expands and air is drawn into the lungs. At the same time, the abdominal cavity is compressed and the abdominal and pelvic organs move down meaning the abdominal wall has to expand outwards and forwards to accommodate this. 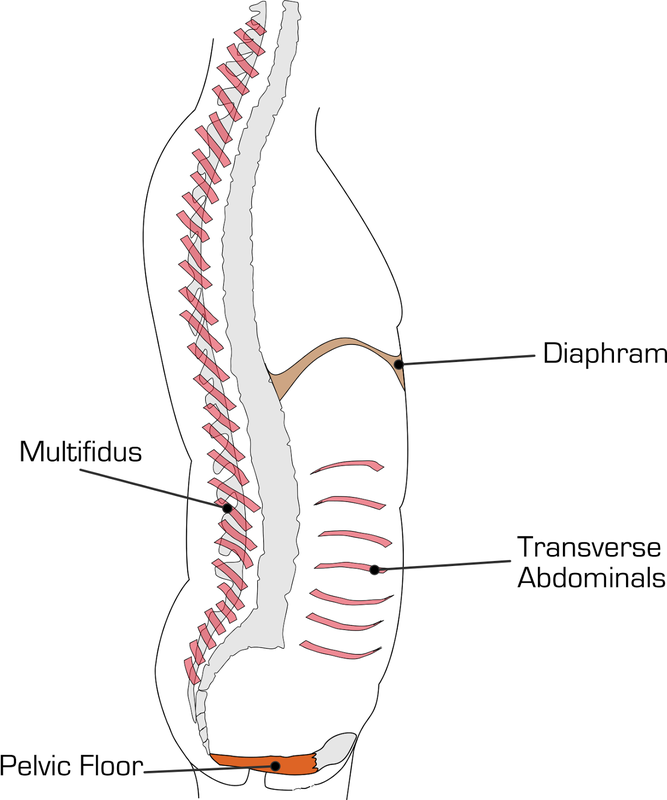 The transverse abdominus relaxes and the pelvic floor descends as it receives the increased load of abdominal and pelvic organs. In the optimal exhale the diaphragm elastically recoils back up higher into the rib cage, abs and pelvic floor contract and the intercostals relax. This sends air back out of the lungs. It sounds simple, so why don't we all breathe optimally? Well chances are that we did when we were young. And then something changed and our breathing changed too. This might have been a physical change to our body - such as our spine and rib-cage stiffened with a lifestyle of sitting and inactivity or we may have had a baby which can both change our spinal alignment and the position of the diaphragm. Or it might be that stress and anxiety have changed the optimal breathing to something more rapid and shallow. The most common breathing dysfunction is chest breathing (referred to as 'thoracic' breathing in the paper). This type of breathing is short exhalation followed by shallow inhalation. Muscles in the neck and shoulders overwork to sustain this. 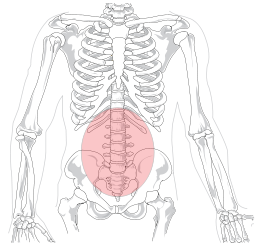 The position of the ribs may well be altered so the front, lower ribs flare upwards. There is likely to be a lack of mobility in the lower ribs and potentially muscle pain in the neck and shoulders. So, where to start on retraining your breath? In many cases it's about re-acclimatising the brain to higher CO2 levels by gradually using longer exhales. And breathing into the back and the sides of the rib-cage, activating the diaphragm more to encourage fuller inhalation. Many thanks to Heather King-Smith for her fantastic Breathing and Alignment training. * Bradley H & Esformes J Breathing Pattern Disorders and functional movement. Int J Sports Phys Ther. 2014 Feb; 9(1): 28–39. The core is the centre, the inside. And our core, like this apple's is central to our body and pretty deep inside us. Unlike the apple, what we have is an 'anticipatory core' which is several sets of muscles which are designed to fire up before we move a limb. This means stability for the abdomen (and therefore our lower back) every time we need it. And these muscles are constantly active as we're using them to breathe all the time. 1. Good posture - particularly how the rib-cage and the pelvis align. 2. Good breathing - using the diaphragm and the intercostal muscles between the ribs to produce optimal diaphragmatic breathing. 3. Motor control of our Transverse Abdominus and our pelvic floor muscles - being about to identify and connect to both sets of muscles. (Research suggests that in those of us with back problems these muscles fire differently - often more slowly or at too high an intensity). These muscles also need to relax as well as to contract. Short, tight muscles are not strong muscles. 4. And a lack of tension in our bodies - conscious and unconscious gripping of muscles in the lower abdomen or the chest can also affect how our core functions. So exercises that train and then strengthen our core are going to be relatively gentle movements combined with body awareness - feeling what's working and what isn't working. When we work harder our bodies will automatically fire more superficial muscles as well. This can mask a problem and reinforce our compensation patterns by more superficial muscles that aren't designed to stabilise us. So doing lots of high impact ab work (e.g. lying on your back with both legs, both arms and your head lifted) is great if you have optimal posture, you breathe well, you move well and have full, functioning motor control of the pelvic floor and deepest abs and you don't have a gripping pattern in your body. But how many of us can honestly say - "Yes, that's me"?!! Some of the best trained Pilates teachers take a minimum of a year to finish training so they have the time to get their bodies to the point where they can master the hardest classical Pilates exercises. 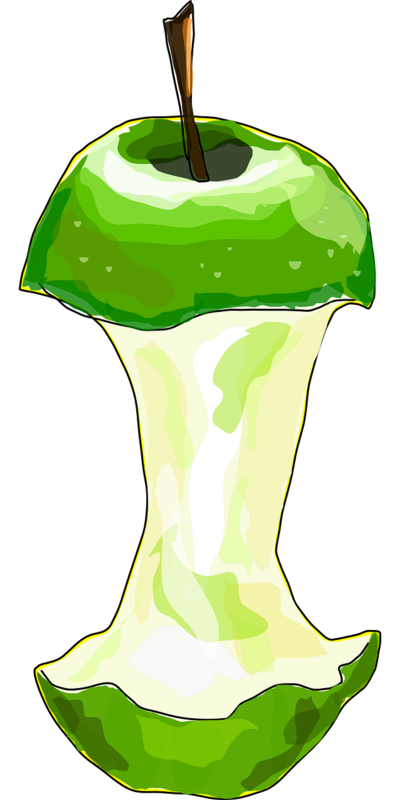 That tells us something..
For a functioning body that feels good - we need to get down to the core. And below, two clients tell us the benefits they gain from our way of training and strengthening the core. I have been surprised at the impact small and seemingly gentle movements have had on my body. Pilates has improved my body awareness, flexibility and strength. I come away from each session feeling more toned but at the same time really relaxed and stretched out. My job causes me to hunch my shoulders a lot thus causing a lot of stress on my neck, shoulders and arms, physical activity does not relieve this but Pilates has helped an incredible amount, through muscle release, breathing techniques and strengthening core muscle. In particular one to one sessions have helped me to really locate the different muscles and work on them to relieve the tension. I also used to suffer a lot with headaches but they are much less frequent now and if I feel one coming on then I can usually apply something from Pilates to relieve it. Caroline’s classes are well structured and she is a careful and focussed instructor. I have begun to understand how small but targeted movement can really help flexibility and mobility. I enjoy the classes and feel I am learning about how my body works and how I can maintain it in good working order.